This was an article given to me by Virginia Dixon, an extraordinary teacher trainer. It appeared in the American Suzuki Journal originally, and then in The Write Note. The job of children is to learn. While still with their mothers they must begin to react to the world in which they live in preparation to cope on their own in the future. If we who are so far removed from childhood observe what styles the children use to learn language, then we might be able to teach these tots anything. I think that we as teachers must remain the students of our students. Children learn from their environment through listening and imitation. When we unsuccessfully force on them someof our adult learning styles and they begin to fail, we must back up, reassess the child’s viewpoint, and try again, this time with his/her needs more in mind. If a child is not learning, it is not because the child cannot learn, but because the teacher is failing to teach. To understand this caring of all humanity that he practiced his entire adult life, it helps to delve into the cultural context in which he lived. During a five-week language study in Kyoto I was privileged to visit the kotsuzumi lesson of one of my Japanese language teachers, thus enabling me to compare a traditional Japanese lesson with Dr. Suzuki’s lessons. The kotsuzumi, a small drum held on the left shoulder and struck by the opposite hand, is an important part of traditional Japanese Noh theater. The performer simultaneously plays the drum and chants material that is taught by rote. This is one of many traditional arts that Japanese adults love to study and perform. On our knees we slid open the studio door, touched our noses to the floor before we inched over the threshold on our fists. We were offered tea and pastry, and an invitation to relax and use the facilities as needed. Within a group of four students, each appeared successively alone before the teacher has the others audited. During this individual time the student was obedient, alert, and fully concentrated. If the student was going to be asked to work hard, the teacher was going to take care that all the needs of the student were attended to first. As I thought of Dr. Suzuki’s story, it dawned on me that at a very vulnerable time during his studies in Germany, he was the recipient of German benevolence, including that of Albert Einstein and his teacher Professor Klingler. Unable to repay these great me directly, he may have chosen instead to address what he felt was a debt with the gift of his teaching to all of humanity. I realized tat this point in my search that these events were resonant with my own life because I left my homeland as well to study in Germany, My rumination of how Dr. Suzuki might have felt were based upon memories of being a recipient of German kindness and a generalized feeling of indebtedness to humanity that I still assume. 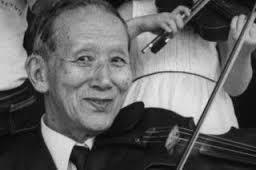 To return to the discussion of the Suzuki Method, in our own country, while we manage fairly well to care for the children, we could do more with the adults. We must guard against importing the trappings of this method at the expense of its heart. Though we understandably love his tricks and games and teaching points, we must remain vigilant to keep Dr. Suzuki’s deeper message in focus. I feel that the children and each parent and each Suzuki teacher —younger or older or newer — must be welcomed and included into the fold and care must be taken for their needs. If a parent comes burdened by life, I listen, soothe, and if appropriate, advise because more often than not it affects the development of the child. I try to do similarly with my colleagues and with teachers who study with me just as I have enjoyed nurturing from mentors and teacher trainers. Often we all grow while sharing in other people’s problems. When helping others I try not to insist on my own way because, to restate part of the above paragraph, “It is up to each educator to discover the shortest and most comfortable way.” I am thus hopefully mentoring without inhibiting the individual’s own creativity. I believe the creativity of our younger members is the most important resource of our organization’s future. If Shinichi Suzuki had been stifled in his creativity, we might never have had the man and his work to emulate. We must boldly believe that creativity will continue to make the Suzuki Method strong and vital in the field of education. Dr. Suzuki was a man with a worldview able to rise above the confines of his own culture. Without his international experience he would not have noticed exactly how well youngsters learn their own mother tongue. He might not have developed the individualism to implement his creative thought. Instead he might have felt safer remaining part of the resilient fabric of Japanese society. From hi own culture he understood the advantages of group dynamics and found ways of encouraging growth through working together. His legacy asks each of us to rise above the constraints of our own culture and to work as a team for a peaceful future. We are also encouraged to approach life with playful humor,thus imitating the children who are in turn imitating us. Most of all, he is a shining example of continued growth. In his nearly 100 years of life he did not give up searching for new ways. The works of Shinichi Suzuki can be read in the same light as Mahatma Gandhi’s biography and writings about Pablo Casals. These were three individuals who felt the truth of human love to their core and expressed it with the fresh innocence of eternal optimism. The inspiration of Dr. Suzuki continually nurtures my most inner self so I can more freely give others of the best I have to offer. Honda, Maasaki. Suzuki Changed My Life, Miami, FL: Summy-Birchard Company, 1976. pp. 74-75.